Many people know these days that the idea of a guy from a cave in Afghanistan conspiring with 19 boxcutter-wielding Muslims, outwitting our entire multi-trillion dollar defense system, lies on insanity. But for this post, let's just concentrate on the science. The WTC was steel and concrete. Airplanes are aluminum alloy with plastic composite nosecones. A real plane would crash against the building, not glide through like a hot knife through butter. I've often thought the "no planes" argument to be one of the most ludicrous ones presented. If there were no planes, what happened to them--and the people on them? If you cannot answer such basic questions, why should I believe you? Er, I would think that, even with my understanding, the planes did exactly what would be expected in the circumstances. Right. How do you know that is not what happened in the complicated process? That thinking of yours has bullets bouncing of normal glass. What happened to the planes? Who knows for sure they even exists. A good question to ask Rumsfeld, who said a missile damaged the Pentagon and "similar" damaged the WTC: "Here we're talking about plastic knives and using an American Airlines flight filed with our citizens, and the missile to damage this building and similar (inaudible) that damaged the World Trade Center." Evil people in the media, the government, the military, and other entities. Some reasons include: Patriot Act and oil. I beg to differ.... your thinking has bullets bouncing off of normal glass. Now I know you are really out of your tree. I have talked to people that saw the planes with their own eyes, there were tens of thousands of people that saw both planes. I know one person whose uncle was just missed by parts of the second plane and I have seen the accounts of people that got hit and killed by parts of the first plane. Computer graphics do not appear in the sky. Computer Graphics do not hit and kill people. If you seriously believe that there were no planes, you are lost, it's time for the rubber room because your are so far in to wonderland that quite simply reality and your imaginary world can never and will never meet. Seek out professional help now before it's too late for you. Softer plane crashes against harder building. A bullet it solid, an airplane is an aluminum tube. Note we must take in consideration the amount of damage done to each item. 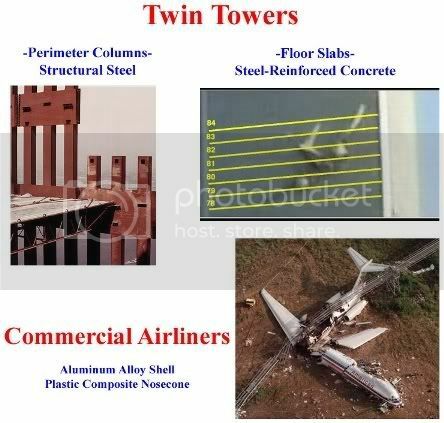 A real plane would receive more damage than the steel building. A real aluminum plane has mass, and would therefore encounter resistance when impacting another mass. 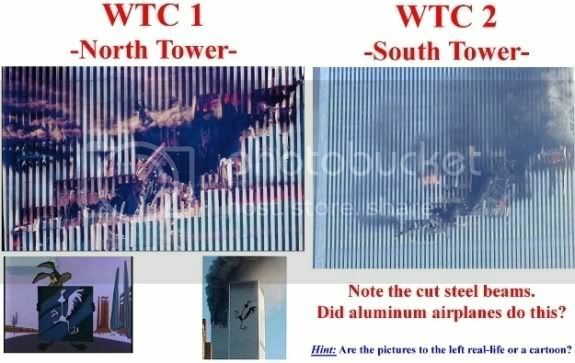 The softer aluminum would crumble, twist, bent, etc as it crashed against the steel beams. It would not effortlessly glide through and create plane shaped holes in the building. First, to clear something up, there is zero evidence than thousands of New Yorkers saw planes hit the towers. You are right that computer graphics do not appear in the sky. But holograms do! Edited the rest out as I think it is clouding the issue. Images not required, I know what I saw on the day from the various news channels that were on the case 24/7. Re impact. Not as simple as that though is it? You have a simple explanation for the construction of the building when in reality it is not. You have the plane represented simply when in fact it was not at that moment of flight. Where to start? Come on, that has more holes than a swiss cheese factory. Note that if there were any validity in your "steel hard, aluminium soft" arguments, then no-one would have to worry about tornadoes, because air is much softer than a house. Well, here's quite a few eyewitness statements for starters. As we were at the box, a plane passes us overhead real low. You could hear it; you could feel it. The second plane came in. It was the biggest noise I ever heard in my life. Well, that's conclusive proof if ever I've heard it. Case closed, the whole thing was a hoax... The Twin Towers never existed.